I became obsessed with my progress the more I played The Golf Club 2019, which is only natural with video games. How far am I? Am I getting better? Given that this year’s title contains the PGA Tour license for the first time, the game has its own built-in career ladder. Although the game quantified my success as I went from the Q-School to the Web.com Tour and finally to the PGA Tour, making it as a pro didn’t feel as powerful as I thought it should. But that doesn’t mean I was unfulfilled. On the contrary, the gameplay was a better chronicle of how far I’d come with the title than which tour I was on. The Golf Club series has never been about upgrading your player like in traditional video games. 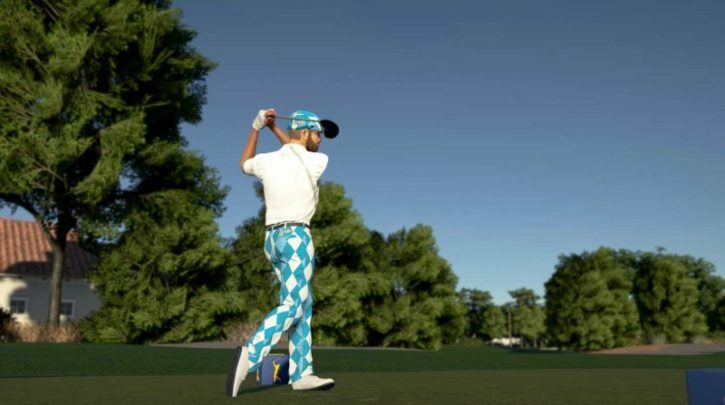 This year has more visual customization aspects than ever (including clothing items from famous brands like Under Armour) that you can spend your earnings on as you level up, but you’re not going to improve your player in the traditional sense by adding points to a putting skill, for instance. I am used to this aspect of the franchise, but even though skills don’t progress in a defined way, I could feel my golfing getting better as I spent more time on the courses. I became comfortable in my backswing and follow-through speed which in turn created consistency – something that’s just as important for your accuracy as keeping the actual movement of the analog stick on the straight and narrow. The interesting thing is that in pressure situations when I needed to clear a bunker on the fairway or not stray from my intended course, the more I tried to consciously put some extra oomph in my shot or wanted to not veer to my right, for example, the worse the results. But the more I relaxed and trusted the game the more I was rewarded – a compliment to the gameplay. My confidence in bunker situations, picking the right clubs and shots, and even hitting straight tee shots (hard to do with the pro club set and beyond), grew over time. While I’m not sure the game always accurately measures the speed of the backswing on chip shots, overall when it comes to balancing out challenging gameplay with the reward of output, The Golf Club 2019 is more than fair. I wanted my gameplay progress and satisfaction to be mirrored in my career as a golfer on the Tour, but I didn’t get the same feeling. The lack of a player upgrade system contributes to this, so despite the presence of the Tour license and six real-life courses, the game has failed to bridge this gap and find more ways to meaningfully demarcate your ascension apart from giving you new pieces of clothing for your avatar. The tour events come and go, but I didn’t feel invested in it (even with rivalries) like I did my actual skills out on the course. Building up your golf society, where you can inaugurate a golf club and recruit other players to post scores and join events apart from the PGA Tour is a way to measure yourself as a golfer in the game, but this is checked by the fact that this feature hasn’t grown since the last Golf Club. Despite the inclusion of the PGA Tour license, the easy-to-use course creator remains a wellspring of content and a key component of the franchise. This feeds into the game’s expanded multiplayer options, including the ability to set up sessions easily with your friends on or offline. Still, the basic matchmaking doesn’t let you tweak parameters such as selecting a course or which tees to use, so similar options like the ones in the private matches would be nice. It may be slightly odd to want more gamification in a series that has resisted it – to its benefit – in certain areas thus far, but The Golf Club 2019’s career mode in particular is more the start of something that could be good rather than its full realization. I certainly don’t want developer HB Studios to change its philosophy and implement a player upgrade system, but something in the mode needs to deliver that hard-to-define but satisfying feeling of progression better than what’s here. Until then the title’s gameplay is more than just a band-aid. It’s fulfilling in its own way – one which is as temperamental as the sport itself – and it’s the fundamental piece of a title whose benefits are more subtle than overt.